Free cash and gift cards are out there if you know where to look! 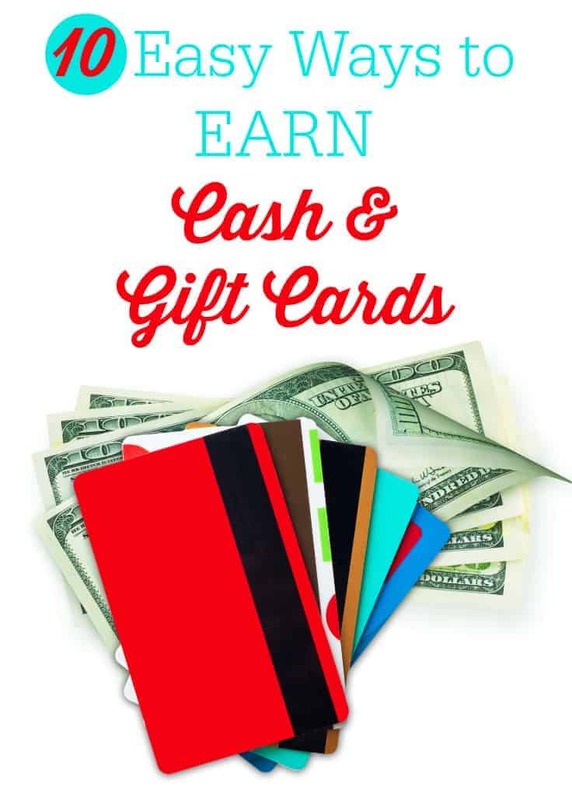 This post today shares 10 easy ways to earn cash and gift cards. Some of the ones I listed I’ve been doing for years like Swagbucks and credit card rewards. Others are still fairly new to me like Ebates and the grocery apps. I only wish I had learned about the sooner because I lost out on all that potential money! Better late than never so they say, right? If I had to pick a favourite from all these programs, I’d go with Ebates and grocery apps. I use Ebates for all my online shopping and the grocery apps every week. I think of them as extra perks for buying items I was going to purchase anyways. 1. Swagbucks. I know some people rock Swagbucks and earn tons there! I’m more of a “slow and steady wins the race” type of person on Swagbucks. I don’t have the app (I don’t think it’s in Canada) nor do I use the Swagbucks search engine. The only thing I do every day is take the daily poll. The Swagbucks page automatically opens when I launch Google Chrome so I quickly do the poll and earn 1 Swagbuck. They also sent me 50 Swagbucks on my birthday. How nice! I save my Swagbucks for Paypal cash and redeem as soon as I have enough in my account. 2. Ebates. If you are shopping online, please listen up! Go to Ebates first and click through their site. You’ll earn money back on your purchase! I’ve been on there a few months and already earned over $80. Payment comes every few months and it is legit! Have a look through the huge list of merchants and you can see what each one is offering in terms of cashback. I bought makeup over the weekend at Pur Minerals and earned 10% cashback in my account. Check out my post about Ebates for more details on how it works. 3. AIR MILES. I’ve been a AIR MILES cardholder since the late 90s when my grandma told me I should sign up. I use my card whenever I can and even signed up with a oil heating company here that gives AIR MILES. When you are paying over $700 a pop, that’s a lot of AIR MILES! They add up fast. I have mine set to 100% Cash Balance so I can redeem the eVouchers. I usually choose the ones from Staples or iTunes (when they are available). 4. Grocery Apps. I started using grocery apps to get cashback on my grocery purchases. Since August, I’ve earned over $150 on items I was planning to buy anyways. I tell everyone who will listen to start using these apps! Every little bit helps. Combined with sales and coupons, you can really save a bundle! 5. Credit Card Rewards. I have to use my credit card every month to keep this blog running! Many of the online merchants I deal with don’t accept Paypal, so I have to use my credit card to pay. I’m ok with that as long as I pay my bill off every month (I detest paying interest!) and I also earn rewards on my credit card. RBC Rewards is one example. I think most banks have credit cards with some kind of rewards program though. I use my rewards for gift cards. Just this past week, I redeemed my rewards for a $50 iTunes gift card. 6. Superpoints. I was active on the old Superpoints, but haven’t really done much with the new site. You earn points by clicking the Superlucky button, sharing Superpoints, filling out surveys and more and can redeem your points for gift cards and other prizes. I spy Tim Hortons gift cards! 7. CardSwap. There are two ways you can earn cash or gift cards from CardSwap. The first way is selling your unused gift cards for cash. The second way is buying gift cards and earning SwapPoints you can redeem for cash or gift cards. I like buying gift cards as gifts for birthdays and Christmas. 8. Shoppers Optimum. Earn Shoppers Optimum points with every purchase you make at Shoppers Drug Mart. I’ve been redeeming my points once a year to buy Christmas gifts. They also have a lot of special promotions where you can earn bonus points on specific days and if you buy certain items. 9. MyCTMoney. Canadian Tire now has a card you can use to earn Canadian Tire money instead of keeping a wad of CT bills in your wallet. I much prefer the card! Whenever I shop at Canadian Tire, I scan my card and earn cash back I can use on future purchases. This is another program where I save up and use once a year! 10. PC Plus. Join the program for free and receive personalized offers. Load the offers and buy the products and earn points. You can redeem them to save money on your grocery bill. Sadly, I moved away from stores that accept PC Plus when I moved to Pembroke. I think the closest Superstore is in Ottawa. Do you use any of these programs from my list? Is there any that you like that I haven’t mentioned. Please share! I use the grocery apps and PC Points (now that No Frills purchases are eligible) but I wasn’t aware of some of the other ones you mention. I did know about Air Miles, and I keep telling myself I need to look into it. Maybe today will be the day. I use some of these but will have to check some of the other ones out. Thanks for the list! Thanks for this information. I will be checking some of these out. I use some of these, though truth be told I have yet to figure out how SwagBucks actually works. Thank you so much for this information! I’m going to check out som elf these. I have some gift cards for a restaurant that we don’t have any where near us. Thanks again! My daughter has been teaching me about Ebates. It’s amazing to see how buying different items and using different sites can earn you cash back. I use some of these….if you stay consistent, these things add up! Totally worth checking out if you haven’t already! I just recently got a PC Plus card and plan to use it! Points are the way to go and hello, free groceries!! I have quite a few of them it’s too much to devote a lot of time to though so I stick mainly to Swagbucks cuz I find you can get rewards faster and I use the PC Plus card and I’ve earned quite a bit so far, I wish I had a PC bank account though. I haven’t tried the grocery apps yet, though I know I probably should. I have recently started paying more attention to the offers at Shopper’s because some of their coupons are really good. I’ve been getting free groceries by using my PC points for a while. I have 2 joined together. I use my PC Mastercard AND get PC points.I use my credit card for everything, and pay it off every month. They then offered my a “black card” which gives me double points if I use it wherever PC product are sold, which is also now Shoppers. I’m always getting anywhere from $20 to ??? off my groceries, which I need to buy anyway. I use some of these, but will check out a couple that I don’t use. I have an Esso card that I use whenever I buy gas. I seem to use it a lot. I use #1 (although not as much as I should), #5 (pay off my balance in full, of course), and #8. I should look into PC Points as I often shop at a YIG. I already use ebates but didn’t know about the rest! Awesome list! I love earning free rewards! Thanks!! I’ve never heard of many of these so will for sure check them out! I do use ebates. Although, I used to forget, so I put it in my favorites bar to remind me. I don’t shop online too much but have earned probably about $25. So cool! I’ve read on Shoppers Drug Mart website that the Optimum program will end in 2016, maybe because the chain was bought by Loblaws which already has the PC Plus program… Such a shame, I loved using my Optimum card to buy bottles of perfume as gifts for free or almost nothing!